After nine years of parties mulletover gets set for their 9th birthday party tomorrow night. 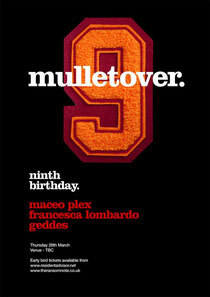 Headlining the 2013 mulletover event is possibly one of the biggest names in underground music, Maceo Plex. Also appearing on the night, supplying her melodic underground house beats, is Francesca Lombardo. With a classical grounding, Lombardo is a genuine musical talent. She has another EP forthcoming on Crosstown Rebels, and is currently on the same agency as Jamie Jones and Art Department. As you would expect, no mulletover birthday party would be complete without its founder and resident DJ, Geddes. Geddes has been hard at work in the studio recently, so expect to hear many exclusives from him as he stamps his and the party’s signature sound on the night.